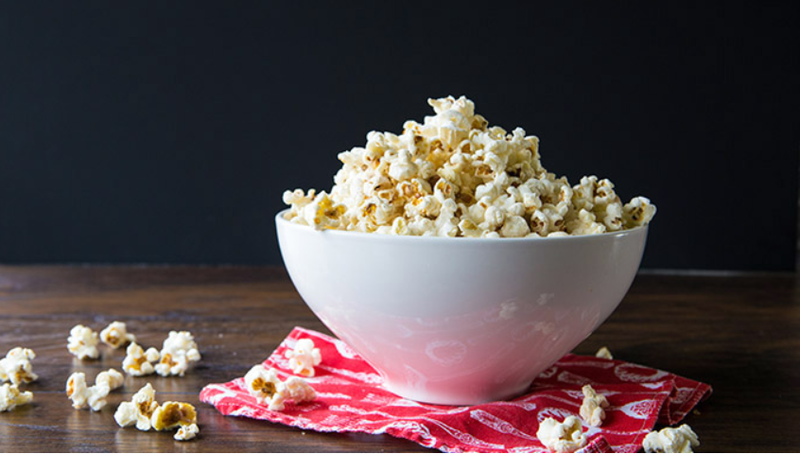 There really IS a right way to butter popcorn, and it's going to change your life. Here's how to make movie-theatre quality popcorn right in our own kitchen. Though we think of butter as a fat, it's actually a container for more moisture than you might think. Milkfats in the butter give it that cool, creamy texture and flavor. When melted, they add a lot of extra moisture. In something like a cupcake recipe, that moisture is fabulous. It makes for extra-tender pastry baking. But toss it on your pops and you'll have sopping wet popcorn in two-seconds flat. Blech. Once you understand the science, it's easy to figure out the solution. Get rid of the milkfat and you'll have butter flavor in pure oil form. In other words, make yourself some clarified butter. Not only will you have drench-free drizzle, you'll also have no-burn butter to pop your corn with and super-infuse it with flavor. Boom! Start with two sticks of butter. It sounds like a lot, but once you remove the milkfats, you'll be left with just enough of the stuff to make a perfect 4-6 person batch. Once the foam is gone, you'll be left with pure yellow, clarified butter. With the milkfats removed, you can now cook with it without worrying about burning it. This is where the fun begins. In less than five minutes, you'll have a batch of buttery butter-popped butteriness without a single bit of soggy. If you're feeling pinched for time, use ghee instead of making your own clarified butter. And if you're really in a hurry, you can simply pop popcorn and drizzle this clarified butter straight onto the popped stuff. It's high oil content will keep your kernels from getting wet, while still giving them all that butter-flavored goodness you've been craving.